Mike Hill, Dare Medflight pilot with the Department of Emergency Medical Services, has been honored as the Dare County Employee of the Year for 2018. Hill received recognition for his dedication to the community at the Dare County Board of Commissioners meeting Jan 7. 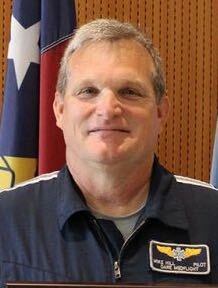 His career began with Dare County EMS in June 2012, when Hill was hired as a Pilot for Dare Medflight. Prior to his career with Dare County, Hill retired with 24 years of service to the U.S. Army, where he flew Boeing AH-64 Apache combat helicopters. Hill has 30 years of flight experience and 5,100 hours of flight time. “Mike is an exemplary employee. The way he carries out his everyday duties, completes his daily assignments and his overall attitude towards his job is inspiring,” said a coworker during the nomination process. It takes a dedicated staff of five pilots to keep Dare Medflight in service 24 hours a day, seven days a week. In April, Hill was just embarking on a family vacation when he was asked to leave and return to Dare County to keep Dare Medflight in service. One pilot was out due to illness, another pilot was on vacation out of the country, and a third pilot suddenly became ill and could not fly. Hill readily agreed and returned that night. If he had not returned, Dare Medflight would have been out of service for residents and visitors for several nights. “Mike is a dedicated, loyal employee, but we would also like to thanks Mike’s wife, Rhonda, for supporting Mike and what he does and for supporting our agency by making that sacrifice and giving up your family vacation to serve others,” remarked Collins during the award demonstration.